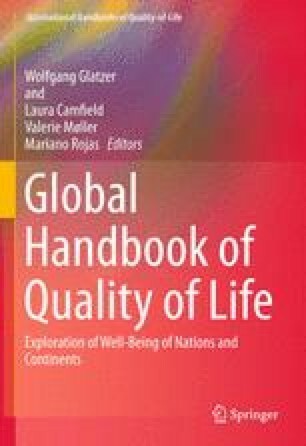 The chapter deals with the relationship between global demographic change and the improvement in health, a core aspect of wellbeing and quality of life, over the period 1950–2100. The global change in population is closely related to the process of demographic transition with declining levels of fertility and mortality. While low fertility is a precondition for limiting global population growth, it also results in smaller birth cohorts, which contribute to the ageing of the population. The increasing life expectancy, in itself an indicator of improving physical health conditions at all ages and thus of wellbeing, also contributes to ageing. Furthermore, older populations are in general more prone to health risks – attendant with the epidemiological transition in the burden of diseases. The chapter depicts the development of global health using selected indicators of the Millennium Development Goals (MDGs) and the Global Burden of Disease (GBD) as measures. The increase in life expectancy at birth in all regions and at all levels of development shows the improvement and convergence of health conditions at a global scale in its contribution to global wellbeing. Institute for Health Metrics and Evaluation. (2012). The global burden of diseases, injuries, and risk factors study 2010. Online Database. www.healtmetricsandevaluation.org/gbd/visualizations. 21 Jan 2012. Swiaczny, F. (2010). Zukunft der Weltbevölkerung. In K. Husa, Ch. Parnreiter, H. Wohlschlägl (Eds. ), Weltbevölkerung (Historische Sozialkunde/Internationale Entwicklung, 30, pp. 39–60). Wien: Promedia. [Future of World Population. Figures with English Glossary available at http://www.swiaczny.de/HSK30_Abbildungen_Figures.pdf]. UN. (2010). UN World Population Prospects. The 2010 revision. http://esa.un.org/unpd/wpp/index.htm. 1 July 2012. UN Population Division. (2011c). Assumptions underlying the 2010 revision. http://esa.un.org/unpd/wpp/Documentation/pdf/WPP2010_ASSUMPTIONS_AND_VARIANTS.pdf. 1 July 2012.